James Gunn has been sharing sketches and photos from the set of Guardians of the Galaxy Vol. 2, and now it seems like the cast are getting in on the action as well. 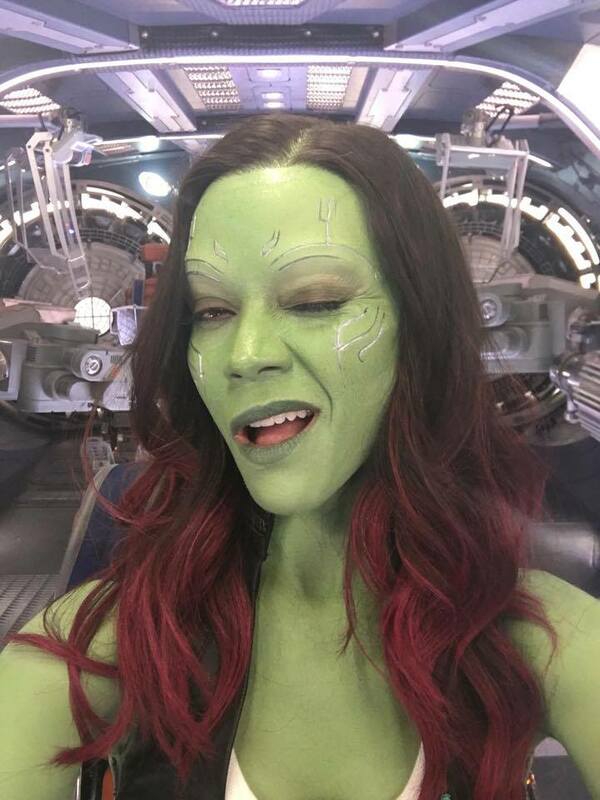 Zoe Saldana took to Facebook today to post a couple of pictures of her in full costume (and make-up) as Gamora, a character who definitely emerged from the 2014 movie as a firm fan-favourite. As you can see, Gamora hasn’t really gone through any significant alterations here and her costume is pretty much identical to the one we saw at the end of Guardians of the Galaxy. Still, it’s going to be interesting to see how her relationship with Star-Lord has developed since the events of that movie, especially as Guardians of the Galaxy Vol. 2 is going to revolve around his quest to track down his father, a character it’s thought is being played by Kurt Russell (The Hateful Eight). Of course, there’s every chance that Gamora will have some romantic rivals, especially with the rumoured addition of the likes of Nebula and Mantis to the team. It’s probably a safe bet that Peter Quill won’t be growing too close to the former, though. Set to the all-new sonic backdrop of Awesome Mixtape #2, Guardians of the Galaxy Vol. 2 continues the team’s adventures as they unravel the mystery of Peter Quill’s true parentage starting on May 5th, 2017.